I can’t believe I’m saying this, but I won! This year’s SCBWI conference was more than I could have ever expected it to be. I got to spend tons of time with my fellow Mentees who were able to be there, see old friends, meet new ones, and just all around be inspired. I’m so excited and honored to share with you my news of winning the Portfolio Showcase grand prize at this year’s SCBWI Summer Conference! Since receiving last year’s Mentorship award, I worked hard revising my portfolio according to the suggestions of the Mentors. Going to this year’s conference with the changes in hand, I felt good about the work I had done but couldn’t imagine it would have been announced as the portfolio showcase winner. It was an amazing moment and continues to feel surreal. To top it off, fellow mentee John Deininger won the Portfolio Honor Award! It felt extra special to be up there together. Everyone around me has been overwhelmingly encouraging. The prize will be an expense-paid trip to New York to meet face-to-face with art directors. I will share more details when I get them from SCBWI. Coming up this week; I’ll share on the blog my portfolio from this year compared to last year, side by side, so you can see what kinds of changes turned it into a winning portfolio! See you at the SCBWI-LA conference! Starting early tomorrow morning is the annual Society of Children’s Book Writer’s and Illustrator’s conference in Century City, Los Angeles. Publishers, editors, agents, art directors, writers and illustrators in the children’s book field get together and geek out about kids books (picture books up to YA novels). What could be better? I’ve been working for the past 6 months on revising my portfolio for the illustrator’s Portfolio Display on Saturday night. After winning the Mentorship Award Program last year along with 5 super talented illustrators (Debbie Ohi, Ashley Mims, Andrea Offermann, Kimberly Gee, and John Deininger), this year will be an important year to show the Mentors (Pat Cummings, Cecilia Yung, Priscilla Burris, Bridget Strevens-Marzo, David Diaz, and Rubin Pfeffer) that I have taken their feedback to heart. Their advice has been an immense help in guiding my work in the right direction. Good luck everyone, can’t wait to see some of you there! I just finished a new illustration for the portfolio! It’s a stand-alone image done in pen and ink. 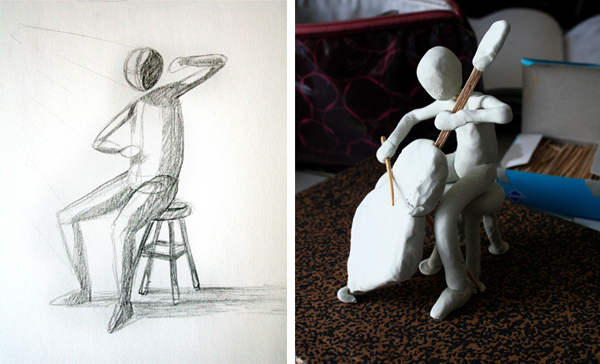 I started with a thumbnail sketch, and then created a crude clay model for lighting studies. I created the full size pencil sketch on my final watercolor paper and began inking the lines. I realized before inking the whole thing that I should try a few tonal studies, so I scanned in the sketch, and printed it out on watercolor paper at about 8×10″ (with waterproof printer ink). This made good practice for the final piece before applying the ink washes. With the SCBWI Summer Conference only a month away, my mentee group gives some great advice on how to prepare your portfolio if displaying in the conference showcase. 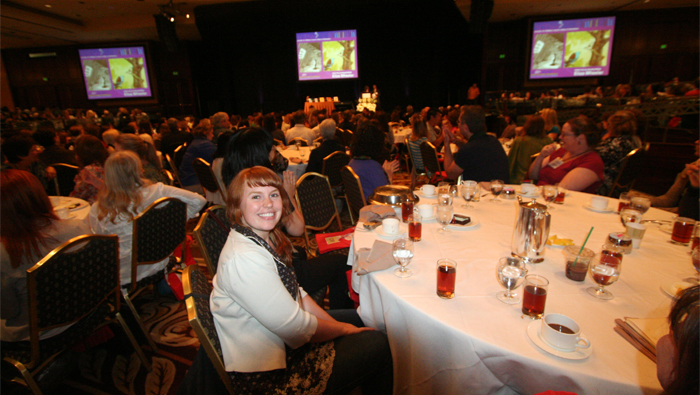 SCBWI Illustrator Showcase Mentees: Class Of 2010 – Illustrator & writer. grab my sketchbook and go. This is one of them. KiahKiean » Blog Archive » 植物園路印度廟 Sri Meenakshi Sundaraeswarar Temple, Waterfall Road. KiahKiean » Blog Archive » 檳城市議廳 Penang Town Hall. 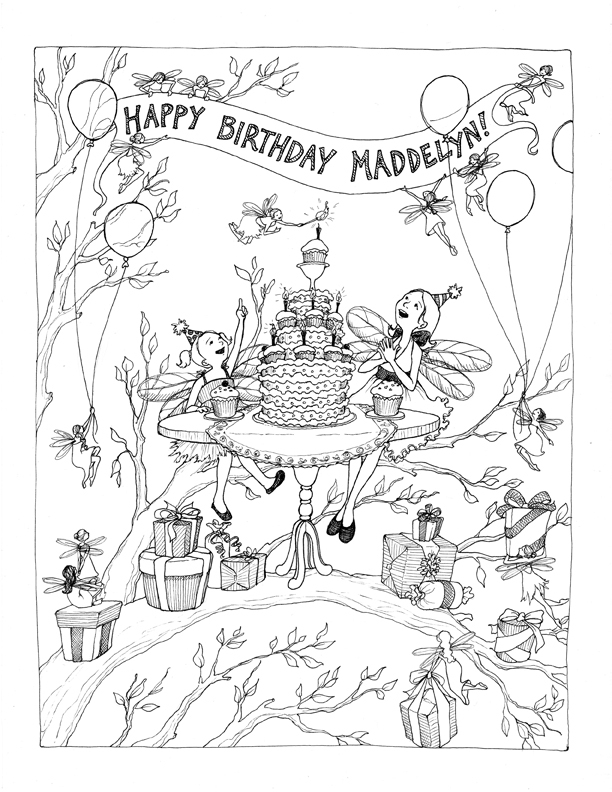 In celebration of my niece’s birthday this past weekend I created a coloring sheet illustration of her and her little sister having a party in the treetops. Happy 7th Birthday Maddelyn! When creating a new illustration where lighting is key, try building a simple 3D model to photograph as a helpful reference. As you’ll see in my examples below, it can be a very crude model made with whatever materials you have handy. I started trying to sketch the figure as a series of basic shapes. Realizing it would be more helpful to see the figure in 3D, I used modeling clay (available in arts and crafts stores), some toothpicks and a pizza box top to recreate the scene in my thumbnail sketch. Building the scene also gives you the ability to look at angles you may not have considered. Stay tuned for the final image! When doing research on putting together a first promotional mailer, I got mixed messages from different sources. In the past, illustrators wanting to introduce themselves to publishers would send out a sample packet consisting of letter-size sheets of images (basically a paper portfolio), which the art director would put in a file. After that first mailing, illustrators would keep in touch via single image postcards, reminding the art director of his/her existence. Nowadays, it seems mandatory that illustrators have their portfolios online. So I questioned the necessity of sending that first mailing of a paper portfolio to art directors. When we find our creative passion, it can be easy to have a one track mind. 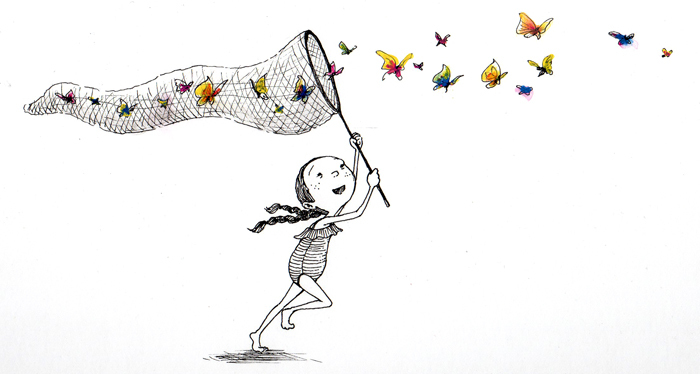 I look at children’s books constantly and love studying illustrations of past and present. While this is great, it’s also useful to keep our eyes open to the world around us. Being inspired by only one field of work can keep us boxed in. During our recent travels abroad my husband and I visited the Vatican museum. 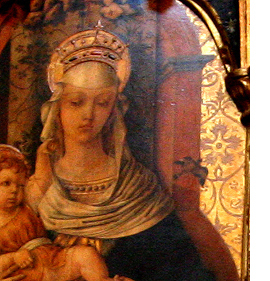 When looking at the collection of Byzantine altar pieces, I was struck by the painting style and the beautiful gold leafing with intricate patterns behind the figures. I found myself excited to experiment with these art works in mind. 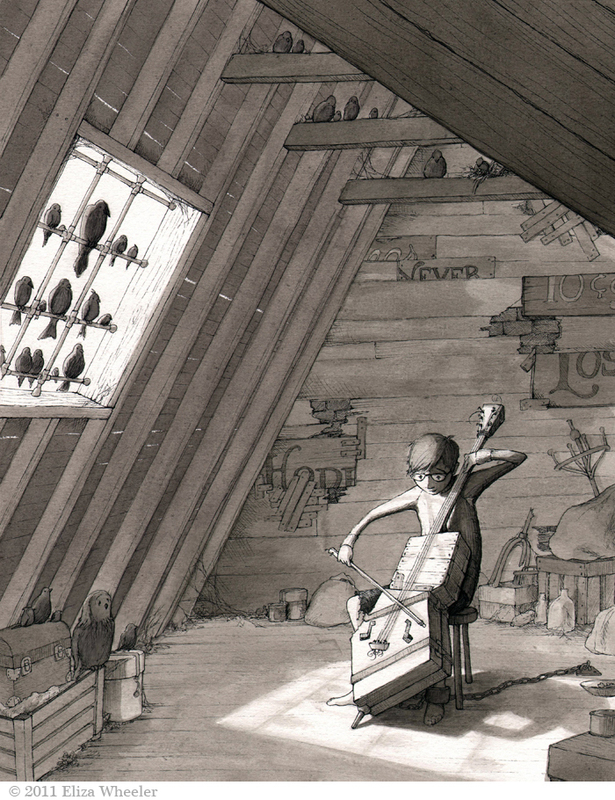 They were some I might not have noticed before, but working in children’s illustration has pushed me to constantly look at what other illustrators are doing, what techniques I might not have considered. Yet tunnel vision can cause me to forget about the vast array of art ready to spark ideas within my own work. Illustrators: look at abstract painting, sculpture, film, architecture, fashion. Writers: read outside your genre; YA novels, adult fiction, non-fiction, classics, philosophy, poetry. WriteOnCon.com is giving away the fabulous prize of an illustration critique with Marietta Zacker of Nancy Gallt Literary. The winner will get to have 10-20 images personally critiqued by Marietta. Just visit the blog and comment on the post!